NEW YORK (AP) — Leonard Hamilton has a problem. He has 10 players who can play. It’s a complication that other coaches only wish they could have. “That’s who we are,” Hamilton said following No. 25 Florida State’s 72-61 win over Illinois in the consolation game of the NIT Season Tip-Off on Friday. 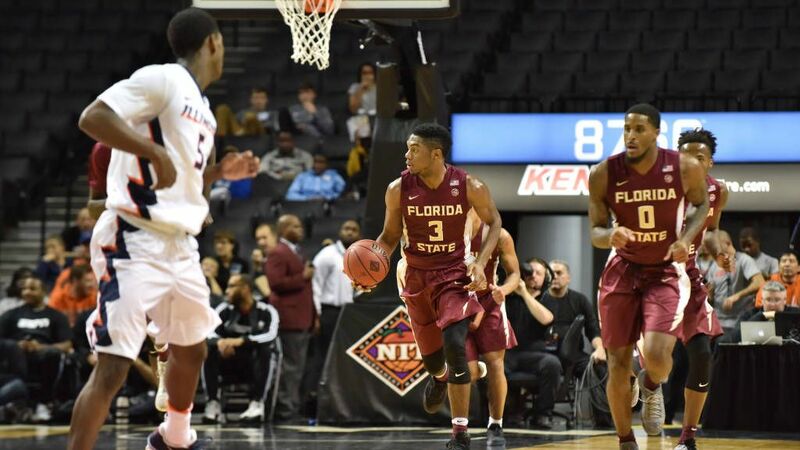 The Seminoles (5-1), which bounced back from their first loss of the season Thursday in Brooklyn, had six players play at least 20 minutes and 10 players played 10 or more minutes. Trent Forrest’s 26 minutes led Florida State. “It’s a little problematic for us right now as we try to play so many different combinations of guys,” Hamilton said. Dwayne Bacon scored 17 points to lead Florida State. Jonathan Isaac had 15 points and seven rebounds. CJ Walker finished with 13 and Xavier Rathan-Mayes had 10. “We sustained our effort, our focus, better than we did yesterday,” Hamilton said. “We got great play from our bench. The guys gave us tremendous energy. They gave Bacon and Isaac an opportunity (for) a breather here and there. Everybody who came into the game contributed. “The residual effect of that was (we) were always fresh; (I) was always able to keep a fresh group in there,” he said. Despite getting a game-high 18 points from Malcolm Hill, Illinois (4-3) lost its third straight. Leron Black chipped in with 15 points, and Te’Jon Lucas had 10. The first meeting between the ACC and Big 10 programs was a taut affair for 30 minutes before Florida State seized control. Tied 44-all with less than 10 minutes to play, the Seminoles outscored the Illini 7-0 in a 56 second span. The run was sparked by Forrest, who had two steals and drew a shooting foul. “That was the key stretch that kind of broke it open,” Groce said. Illinois had cut the deficit to 55-50, but as soon as it looked as if the Illini were about to make a game of it, the Seminoles went on an 11-1 run to extend their lead to 66-51. “Against a team of that quality in this type of environment if you don’t get stops but two out of 13 times during that stretch when it went from 44-44 to when they got the lead, it’s tough to win,” Groce said. Illinois: The Illini came into the tournament having won four of five. The Illini leave Brooklyn having been swept by nationally ranked West Virginia and Florida State. While Illinois was more competitive against Florida State than it was against West Virginia, the Illini were outclassed in the final 10 minutes of the consolation game. Florida State: The Seminoles had not played a game in which they scored fewer than 86 points this season until this win. Florida State: Despite the win over Illinois, Florida State may drop out of the Top 25 due to its loss to unranked Temple on Thursday. Illinois: Senior guard Tracy Abrams was examined by a trainer during a second half stoppage in play after being inadvertently elbowed in the mouth by Florida State center Michael Ojo, fighting for position in the low blocks. Florida State: Finished the game with seven blocked shots and five steals. “We try to be consistent. It’s somewhat challenging this time of year for us (with) five new players (we’re) trying to rotate (into the lineup). They’re getting a lot of minutes,” — Hamilton on the benefit of having a deep roster once conference play begins. Illinois: Will face the North Carolina State Wolfpack Tuesday in the ACC-Big 10 Challenge in Champaign, Illinois.